Sakya Dolma Choe Ling is an informal group of Buddhist practitioners open to people from all walks of life, whether Buddhist or not. Our teacher is Lama Choedak Rinpoche, an accomplished teacher in the Sakya tradition of Tibetan Buddhism. The group is dedicated to making available to the public the wisdom teachings of the Buddha and the Buddhist practices of meditation. The main gathering place is a beautiful private gompa in the peaceful suburb of Eastwood, only 30 min drive from Sydney inner city. Lama Choedak Rinpoche has been born in Tibet, escaped with his parents to Nepal during the Chinese invasion and trained for 12 years under the personal tutelage of His Late Eminence Chogye Trichen Rinpoche. Rinpoche completed a solitary three and a half year retreat under the sponsorship of His Holiness the Dalai Lama and came to the West where he has been teaching since 1987. 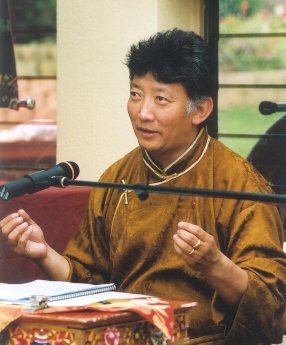 Lama Choedak Rinpoche has established many centres in Australia and New Zealand. He lives in Canberra where his main centre Sakya Losal Choe Dzong is located. Lama Choedak Rinpoche comes to Sydney regularly to teach and our group offers meditation courses and practice sessions. Lama Choedak Rinpoche’s profound explanation of meditation and its everyday relevance is renowned for its lucidity, authenticity and humour. Eloquent in the English language and familiar with the Western mind, Rinpoche offers teachings from the heart, and spiced with the richness of his knowledge, dedication and realisation.